The second of my two caches relating to Our Lady of Aberdeen. The first is GC61JDE. Cache placed with kind permission of the parish priest. PLEASE NOTE, THE CACHE IS NOT ONE OF THE BLACK 'CODE-LOCK' BOXES IN THE COURTYARD. A cache placed in the courtyard of 'The Hidden Gem of Aberdeen', St. Peter's Church on The Castlegate which contains a replica statue of Our Lady of Aberdeen. This cache was formerly known as 'Our Lady of Aberdeen Part 2: St Peter's Church' before being welcomed into the Church Micro series. To read the full background to the Our Lady of Aberdeen statue, please see the information written on my other cache GC61JDE (Our Lady of Aberdeen Part 1: The Bridge of Dee). St. Peter’s was the first Catholic church to be built in Aberdeen after the Reformation, with its foundations being laid under the supervision of Reverend Charles Gordon in 1803. The land which includes the courtyard and close of houses had previously been gifted to the church by a Catholic merchant, Mr William Young, in 1771 with a priest's house and small chapel being erected on the site. However, an increase in numbers to the congregation necessitated the remodelling of the close and the building of a larger church - resulting in the design we see today. Even prior to its most famous period under Priest Gordon the area had been the site of various religious houses, with the most famous being that of a religious house of The Knights Templars and The Knights of The Hospital of John of Jerusalem (Knights Hospitaller) from 1113 - 1548. A plaque commemorating these can be found on the outer wall of a passage to the east of the church grounds. 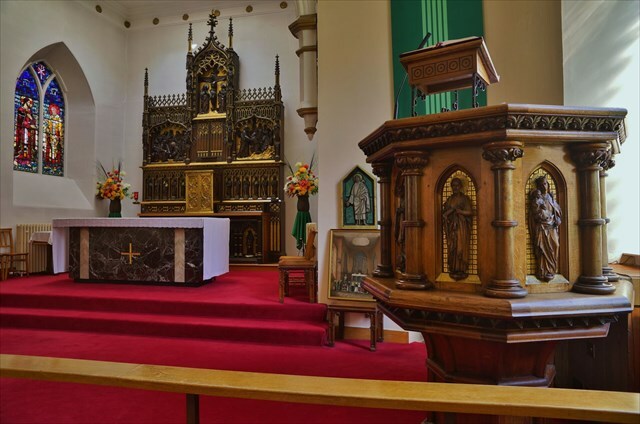 Inside the church are to be found some lovely paintings, carvings and other religious works of art including the replica statue to Our Lady of Aberdeen and the side altar on which it is placed. In the entrance stairwell is to be found a beautiful copy of Mariotto Albertinelli's 'The Visitation'. This painting was gifted to the church in the 1820s by King Charles X of France and was the altarpiece of the chapel during its period of semi-closure from 1861-1880, when it was known as Our Lady of The Visitation. Continuing through the doors into the 'day chapel' there can be found on the left a highly decorative stained glass window, created in 1959. 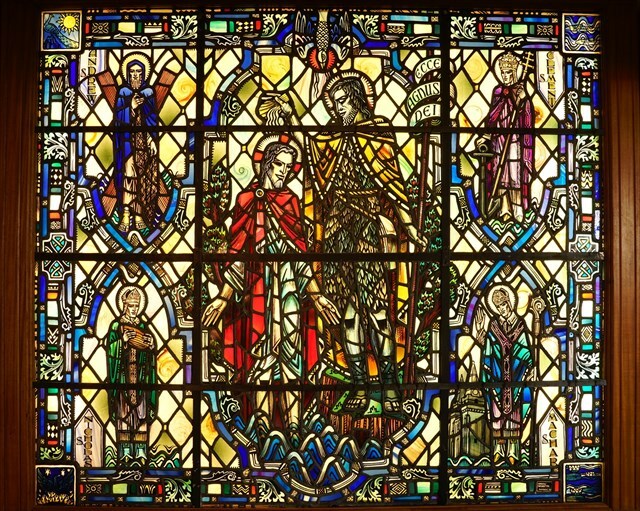 This depicts the baptism of Christ which is surrounded by four patron saints of Scotland/Aberdeen - St. Andrew, St. Nicholas, St. Machar and St. Clement. In the main body of the church are to be found a set of glazed clay stations of the cross which were made by a Polish artist in the 1960s. Above these on the left wall is a painting by Karel Dujardin (1622 - 1678), a Dutch Golden Age painter. This is of Mary, the mother of Christ and John, the beloved disciple, at the foot of the cross at Calvary. In the space opposite, on the right hand wall, hangs a much smaller modern copy of The Descent of The Holy Spirit at Pentecost which is hoped to be replaced with a much larger painting of Priest Gordon by Sir John Watson Gordon, PRSA (1788 - 1864) in a similarly designed frame. The reredos (decorative carved screen) behind the altar is believed to be Belgian in origin and is a masterpiece of carving. It depicts a number of saints and several scenes from the later life of Christ. 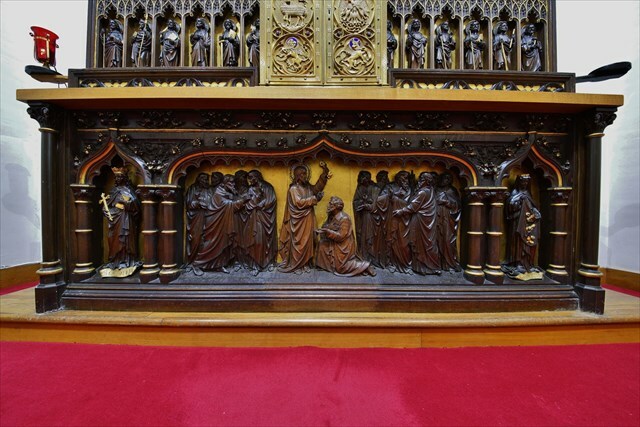 On the bottom level (not visible behind the altar) is a carving of Christ giving the keys of Heaven to St. Peter in front of the other disciples with St. Margaret of Scotland and St. Elizabeth carved one on either side. 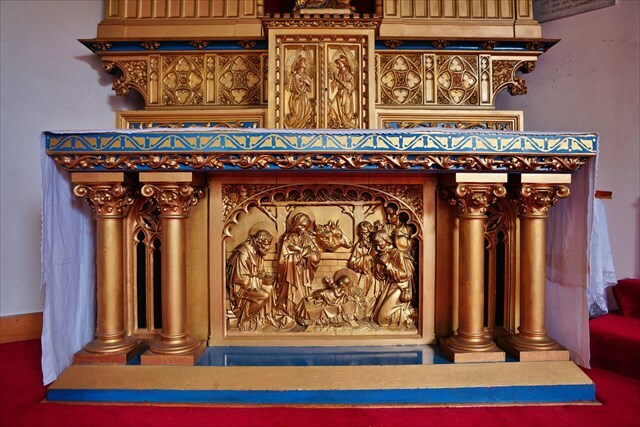 The next level up contains carvings of the twelve apostles, in two groups of six - one either side of the tabernacle which is decorated with semi-precious stones and enamel-work. The next level has two main scenes, both from the life of Christ. The one on the left shows Christ washing the apostles' feet at the Last Supper and that on the right is of Christ holding up St Peter when both walked on the water of the Sea of Galilee whilst the other disciples look on from the boat. The central top level is a carving of the crucifixion. Also in the sanctuary, on the left wall, is a stained glass window depicting Christ handing the keys of Heaven to St. Peter. This was created by Joseph Nuttgens in 1955, to commemorate the centenary of the death of Priest Gordon. All these bring us then to the real reason for the cache outside - the altar and statue to Our Lady of Aberdeen. 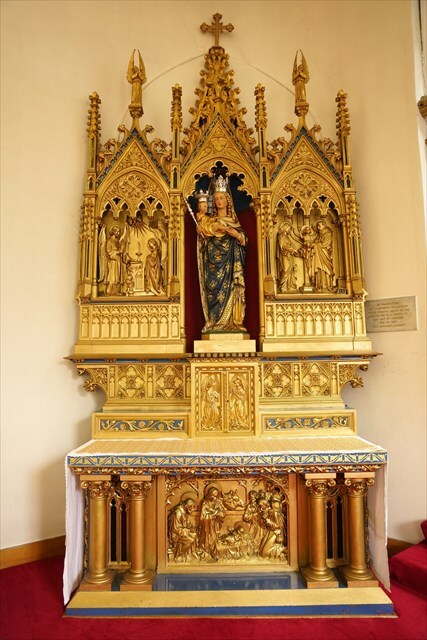 The altar is again believed to be the work of Belgian craftsmen and indeed can be seen to copy the shape of, and many of the designs found on, the reredos. This was the gift of a poor serving girl of the parish, Miss Elsie Robertson, and her sister in 1897 and both this, and the statue placed in the centre of it, were erected by the Rev. Donald Chisolm who was in charge of St. Peter's from 1895 - 1899. The altar is highly decorated with floral carvings and has three main scenes on it - all related to Mary and the early life of Christ. On the bottom level (partially visible behind the chairs) is a scene depicting The Nativity, or birth of Christ. On the upper level, one either side of the statue are found the two other carvings. The one on the left is of the Annunciation and that on the right is of The Presentation in The Temple. The cache itself is a small lock-&-lock box with room for trackables/swaps and is hidden in the courtyard. Please place back carefully with the lid side towards the hooks. Note: Please be aware that various groups do use the church halls which open onto the courtyard and that the courtyard is also overlooked by some private houses so extreme stealth should be employed!!! There are security cameras in the courtyard but do not worry - the parish priest approved the placing of the cache.